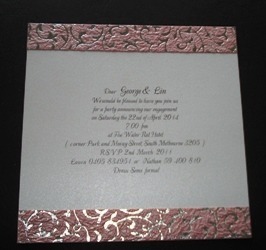 Digital black printing is the most popular for wedding invitations. We never print until we have a final okay from you and we will send proofs via email in jpeg or pdf format. 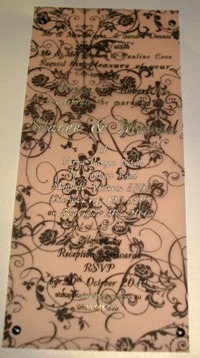 this invitation has had Rococo foil paper applied to base card using double sided adhesive. we have a extensive library of fonts that you can choose from prior to any design we will send you a pdf so you can choose fonts or you can suggest fonts of your choice subject to us having them or you supply.